This beautiful Power bracelet looks amazing. It's White Jasper design will look lovely with any outfit. 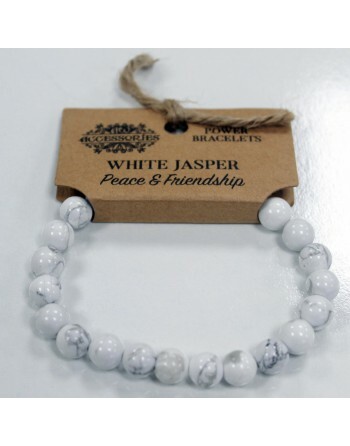 And not only that but White Jasper has its own individual benefits. It is said to help balance emotions and enhances the ability to be able to relax and be calm. You also need not worry about the bracelet fitting you, as they have stretch in them. It makes a perfect gift for anniversaries,Christmas,Valentines and also birthdays. Or it could just be a little treat for yourself. Order today to get this amazing value Power Bracelet! Traditionally, Tigers Eye was carried as an amulet against curses or ill wishing. It is known to give the wearer confidence, courage and strength of will. Howlite is a super-calming stone and many people use it to relieve stress of all kinds. 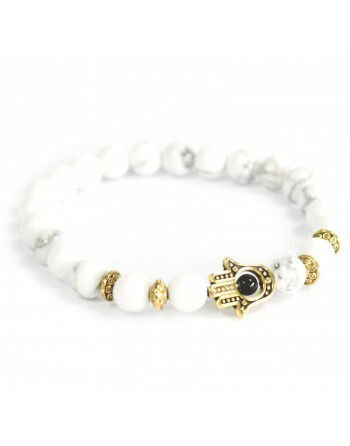 Howlite is an aid to insomnia, especially when caused by an overactive mind. Born in fiery brimstone that bubbles to the Earth’s surface (and eventually cools), lava stone comes from the core of the earth. Lava is a rock formed from magma erupted from a volcano. Agate, like all black gemstones is a protective and grounding crystal. Historically agate was placed in water for cooking or drinking to dispel sickness.